Quadrant 4 System Corp (“QFOR”) in Rolling Meadows, IL, is a SMAC (Social, Mobile, Analytics and Cloud) technology company offering state-of-the-art PaaS (Platform as a Service) and SaaS (Software as a Service) solutions in Healthcare, Media and Retail. The Company was seeking to refinance its existing working capital factoring lender, $3,000,000 of mezzanine financing and secure incremental capital for growth. The company retained Concord to run the refinancing process and secure a new senior lender that can grow with the Company. Concord quickly understood the story of the credit and presented the opportunity to a variety of asset-based lenders across the U.S. Critical to the transaction was refinancing the existing mezzanine financing. 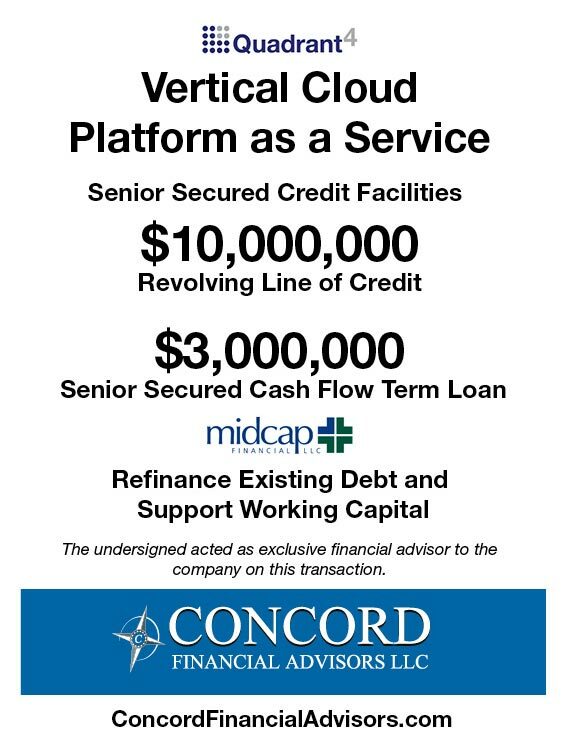 Concord secured a market based asset-based credit facility from MidCap Financial, LLC that included a $3,000,000 senior term loan. The new facility greatly improves the Company’s cost of capital and provides ample availability to accommodate the Company’s growth projections.